You're familiar with Miguel Galluzzi's work, even if you don't recognize his name. He created the original Ducati Monster and, more recently as Piaggio's vice president of design, penned both the Aprilia Dorsoduro and RSV4. Now, he's been tasked with re-imagining Moto Guzzi for the 21st century. We sat down with him at the 90-year old factory in Mandello del Lario and talked about where Guzzi is going. A brand with a history. "The image of the first Le Mans is something that someone who is into motorcycling can not forget. The V7 Sport, those kind of bikes, they stay in your mind forever. To me Guzzi represents a kind of very dynamic sport which is not the same as what we see today in superbikes. 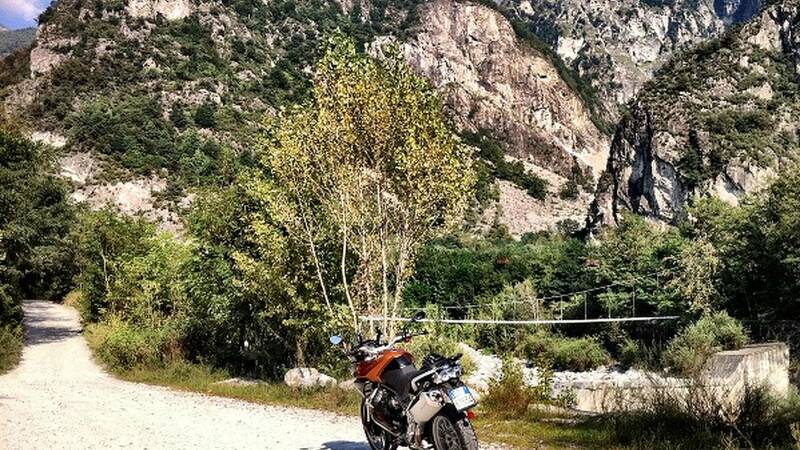 The riding you do with a Guzzi lets you enjoy the landscape while also having fun at the same time, but without having to slide the knees on the ground." "The first project when I got to Aprilia was the Dorsoduro. 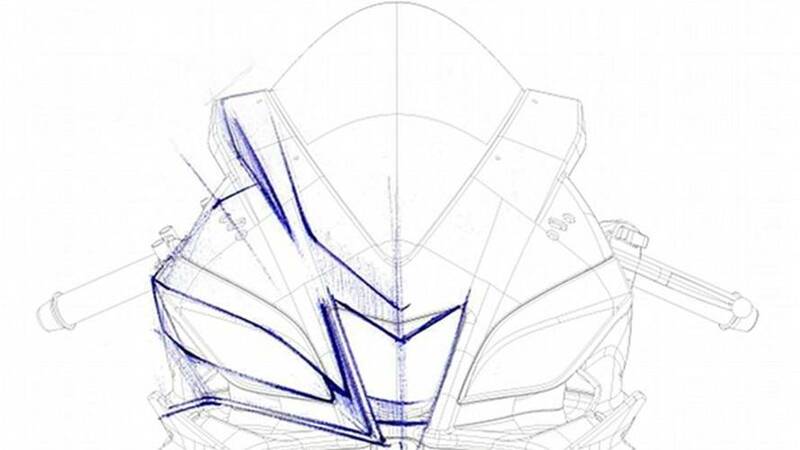 That was the first bike designed for Piaggio with me as the head. Then, the big project at the time was the RSV4. That took a lot of time and effort to get this thing with such a beautiful engine done, but we got a unique superbike that was able to win a World Championship its second season." "From that moment on, Piaggio’s president decided to concentrate everything in one technical center in Pontedara for the scooters and one technical center in Noale, where Aprilia is, for the motorcycles. 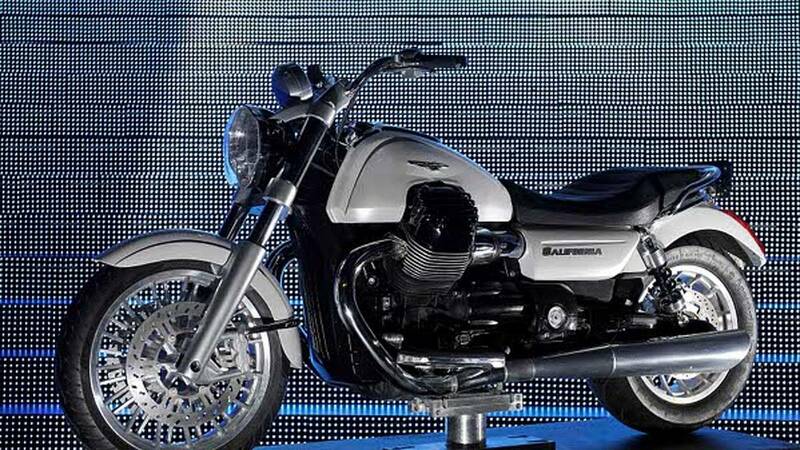 So, we have been concentrating on the two brands and now we are very, very busy on Guzzi." 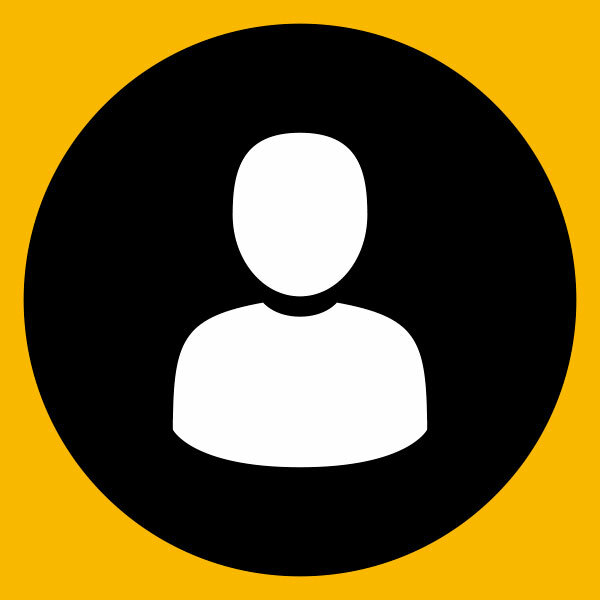 "When we do design, we have to understand what we are doing. We are choosing to go in a very, not simple, but straight forward way for Guzzi. Because Guzzi has always been like that. You don’t need to get too fancy, you don’t need to get too technological like Aprilia does. Aprilia is the top of the technology, Guzzi has to keep a certain tradition, one attached to the enjoyment of riding a motorcycle." "The V7 Racers, that was the first thing we really did for Guzzi. We saw at the Milan show, the reaction from people was, ‘Wow, that’s pretty neat.’ So, we thought of making 150. Now, sales are coming from all over the world. It became a huge thing." "We had a lot of aftermarket parts we wanted to show, so the Centro Stile, we said, ‘why don’t we do a special bike and put all the stuff on it and get the feeling of a classic Guzzi. Everyone remembers this tradition, it is not the tradition of superbikes that we have today." "We were looking this morning at the V7 Sport from the ‘70s and we remembered that this was the first bike to reach the 200kmh mark. It was the fastest superbike. But, look at what we have today, something went wrong. If we were able to have that much fun at the time, why are we doing the stuff we do now? So, the V7 Racer and some other things we are working on in that direction are going back to that feeling." "We need very little things to enjoy a ride on a motorcycle. Very few things. 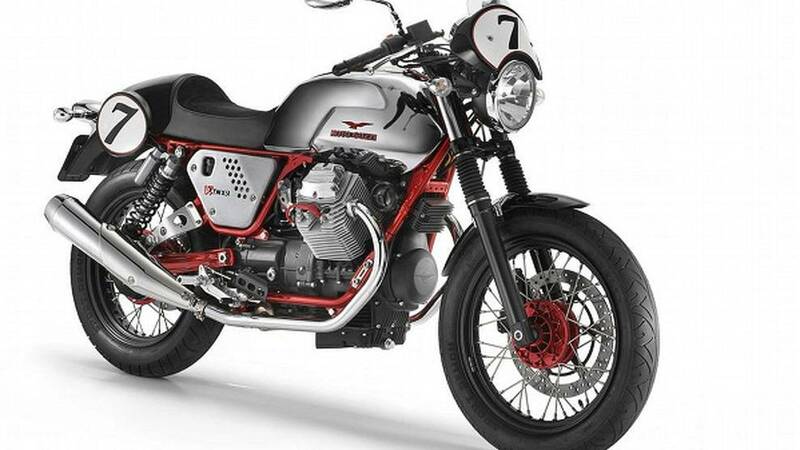 We know there is this craziness about cafe racers right now, but we are thinking about Guzzi as the simplest way to have fun on a motorcycle and that is going to create its own feeling. It’s not going to be retro, it’s not going to be vintage, it’s going to be something that is Guzzi all the way." "On the other hand, we are working on the future, the real future. Guzzi is going to go through a new engine, go through a new mode of performance. The motorcycle technology department works attached to the motorcycle racing department, which is one of the best in the world. 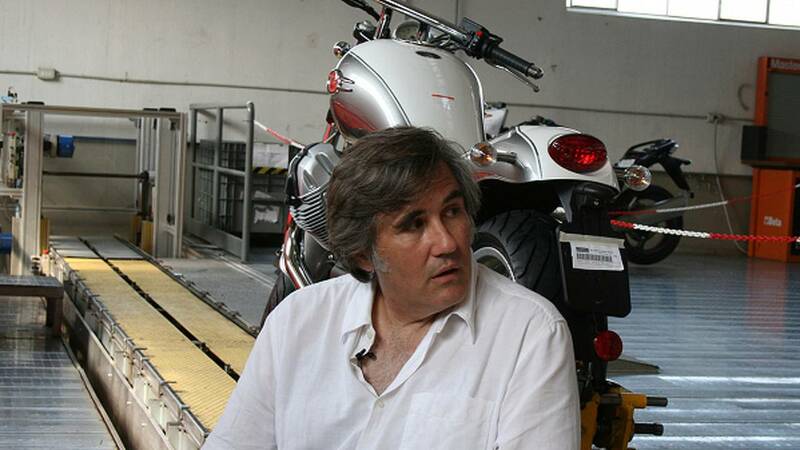 All these energies are getting together in order to create a new Guzzi and, as you’re seeing, a new Aprilia." 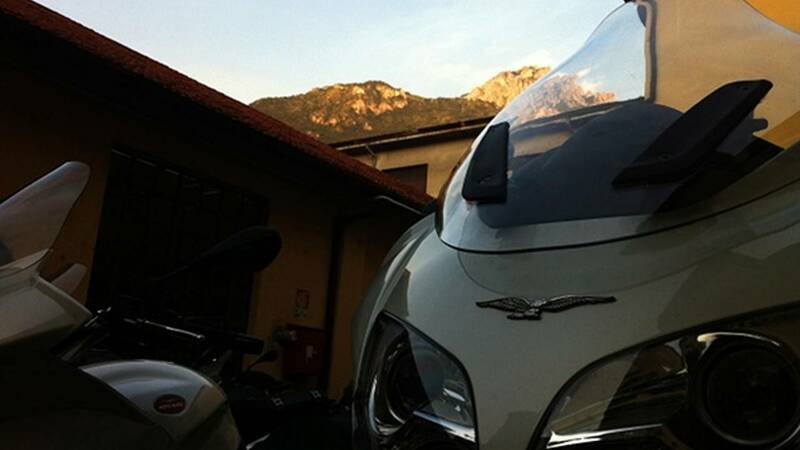 "These are very exciting times for Guzzi. For the first time, we have the knowledge, we have the people and we have the money to do the project, so we are working very hard on that." 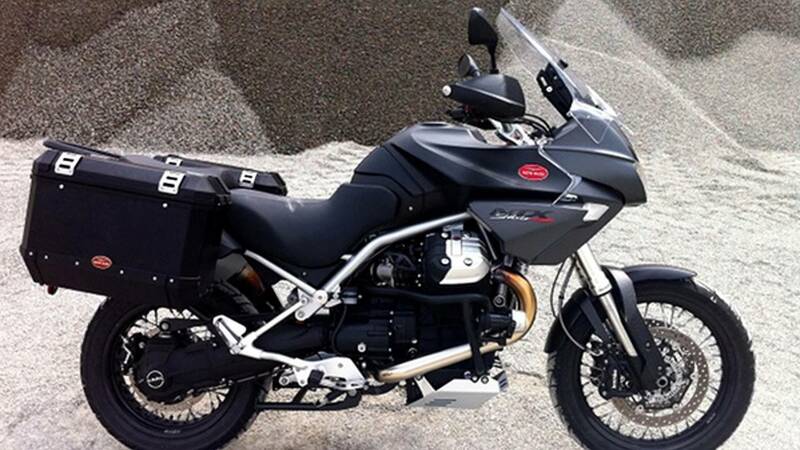 The first new products of the new Moto Guzzi. "We presented in February the new California, which everybody saw, I’m sure, on the Internet. That was a mockup, but right now we have the first prototypes running. We are thinking variations on the same theme, so we will not only have the California. From that moment on, we are moving into a new engine that is going to be the future for Guzzi for the next 10 years." 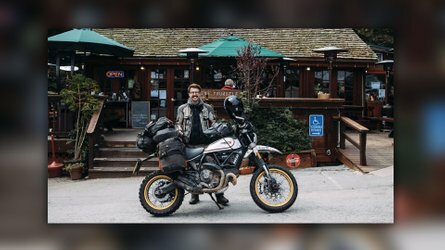 "That’s going to be a lot of fun because we are not only concentrating on making nice beautiful bikes, but everyone knows that weight is a big problem. A big, big problem. Especially with all the laws we have to comply with in order to homologate motorcycles. 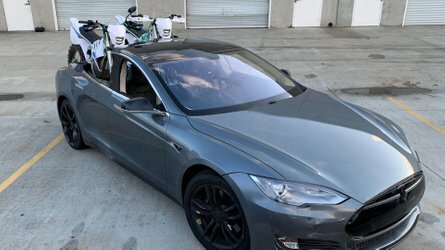 We’ve got a lot of electronics and stuff, so bikes are becoming really heavy. Our goal now is to try and go in the other direction without losig all these technologies we’ve gained over the last 10 years. That’s our new challenge for Guzzi." "The new California will have a 1,400cc engine. The Guzzi engine doesn’t need a big displacement to have very high torque, so we are going to have a lot of fun with this bike. It’s like having a big block Chevy in a motorcycle. Production of the California will begin around the end of 2012." 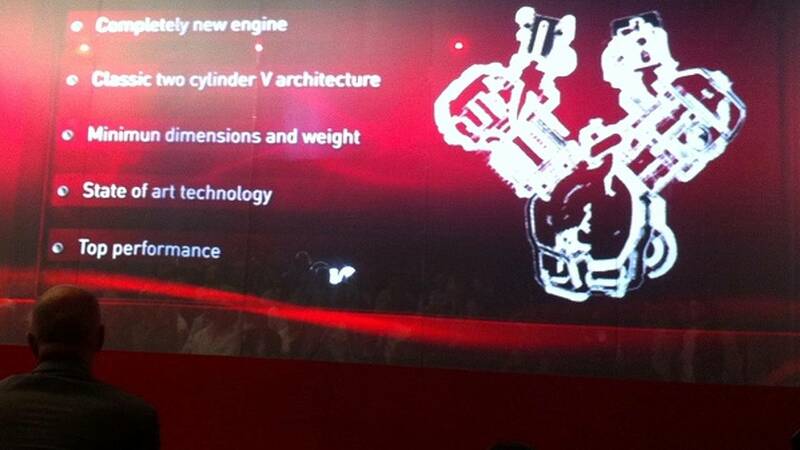 Piaggio execs displayed this slide on the new engine during a recent press conference. "We are also working on a new engine that will be lighter and smaller. The new Guzzi product range is going to be simpler. We are going to have the small displacement (750cc) as we always have, we are going to have something in the middle that is going to be 1,200 or 1,300 and we are going to have the big block. From these three lines of engines, we are going to work to develop new models. The middle is going to be a big middle. Guzzi is about big torque engines, there is not going to be a small displacement, nothing like that." "We are going through a time of color blindness. People want things in black or white and, if they do choose a color, they go for grey. Working for Aprilia and Guzzi, we don’t think like that. We try to push new colors and the orange Stelvio is a good example." I took that orange Stelvio down some dirt roads in the alps. It was a bit top heavy for the rough stuff, but it sure looked nice. 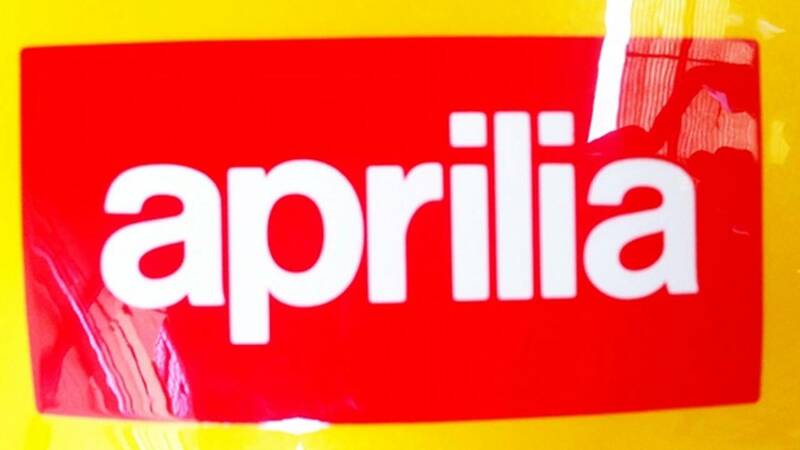 "Having on center concentrating on the two brands and having that center in Noale, Aprilia has this long history with colors and finish and whatnot. This is also the direction of Guzzi. So, the experimentation with colors that used to be impossible for Guzzi is going ahead. The burnt orange was intended for another type of vehicle, but we tried it on the Stelvio and decided this is great. And now it’s the best selling Stelvio, because of the color. Color can make the bike be perceived better." "The way we decide the colors is a big process that starts usually two years before the bike goes into production. We have an interface with people from the fashion world and look at the trends of motorcycles. We try to be as close to the fashion world as it is possible to get, but we first have to develop the colors to see if they work. In the case of the Stelvio and Griso, the colors were developed way ahead of production because they are very special colors that need a special process. Experience with Aprilia helps with this development." Guzzi and Aprilia under one roof. "The concentration of all these energies in one place, in this technical center, has made the Guzzi and Aprilia products have very good quality. 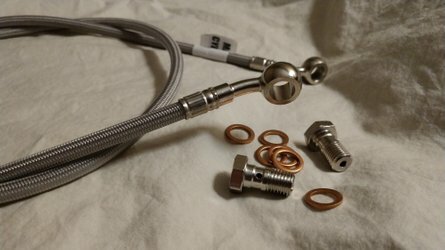 Not only that, but the whole projects, from the first piece of the wheel to the last bolt and nut, are completed as a whole." "The new Norge and Stelvio eight valves are the first bikes that the technical center has taken care of and everyone is saying that this is a big improvement to what Guzzi has had in the past. There are a whole bunch of people, very professional people, taking care of these brands. 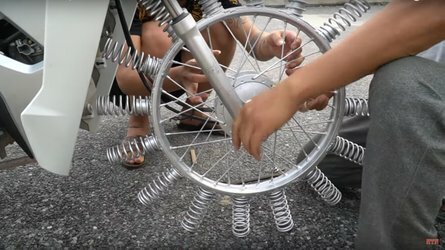 Not only on design and making beautiful bikes, but also in the mechanics." "We had the possibility of making a big tractor bike. That was the idea behind it. We already had a very freeway-oriented bike in the Stelvio, so the actual NTX prototype was not that civilized. It had big knobbie tires and whatnot. But, in the end, that was not possible to do. But, we didn’t lose the aspect that, when you see it, you know you could go around the world. No matter what, nobody’s going to stop you. With a 32-liter tank, now you can drive all over the world without stopping for gas." "Everyone thinks the new Norge is the same bike as before. But, if I tell you that we changed everything, you wouldn’t believe it. But that’s what we’ve done, everything. The fairing looks the same, but the only thing we kept was the interior of the headlights. The bike is completely new. We not only improved the engine and the rideability of the engine — we now have the oil-cooler, which makes the engine run more smoother — but even the riding position was changed. Even the possibility of having a seat which is softer and more ergonomic." "We were surprised because, when we got the Norge two and a half years ago, it was not a great bike. Now, everybody here fights to get one because it is a bike you can really enjoy riding. We are making better bikes for everyone to enjoy." "To me, the motorcycle is all about details. We really enjoy working in the little details, for example the bolt that affixes the shock absorber on the V7 used to be a very flat washer with an alan bolt. Now, we have a piece of aluminum that takes an entirely different approach. 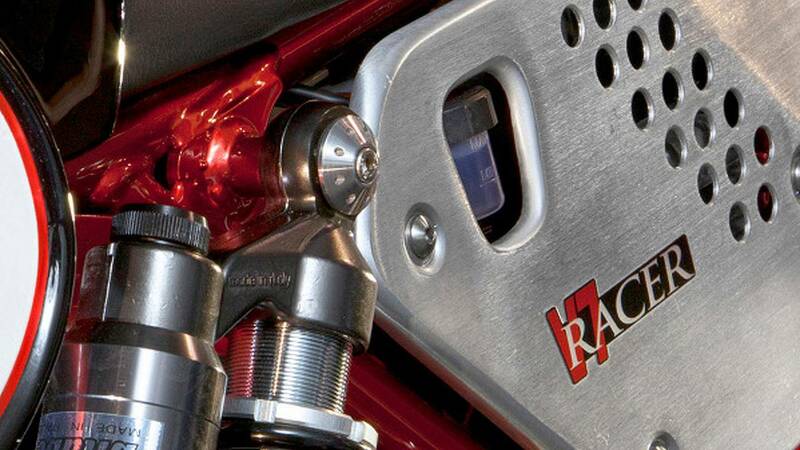 That might seem superficial, but when you see the whole, the details make the motorcycle. A bolt is almost more important than the paint."